Turn up the thermostat and turn on the shower… What if we all do it at the same time? Location of the Chalk Creek and Coalville gas storage units east of the town of Coalville, and location of cross section A – A’. Outcrops of the upper Frontier Formation define the Coalville anticline. It’s the middle of winter, there’s snow on the ground and the skies were clear last night. As a result, the temperature has dropped into the subzero range. You climb from beneath those warm covers, turn up the thermostat to your gas furnace, and step into the shower for a spray of hot water heated by natural gas, hoping it will wake you up for the day ahead. You probably won’t be surprised to hear that you’re not the only one doing that. In fact, more than 700,000 households in Utah use natural gas and most of them are probably doing the same thing at about the same time. This often results in an increase in gas demand statewide at 8:00 to 9:00 a.m. of 15 to 30 percent from the nighttime low. Also, there is a large seasonal variation in gas usage. The typical Utah household uses up to 610 cubic feet (CF) of gas per day during January and as little as 80 CF per day during August. Statewide, Utahns will use as much as 900 million CF of gas per day during some of the coldest winter days. How large is a million cubic feet? As an example, the interior of the new six-story Salt Lake City library is about 2.4 million cubic feet. Most of the natural gas we use in Utah is supplied by Questar Gas Company from wells in southwest Wyoming and the Uinta Basin in eastern Utah. How do they handle such a large increase in demand so quickly when the wells are so far away? The sudden demand known as “peak load” is met, in part, by extracting gas from sandstone beds that are used as underground storage units near the town of Coalville just east of the Wasatch Front, the major population center in Utah. A pipeline transports gas from Wyoming down Chalk Creek Canyon to the Coalville compressor station. From Coalville, a gas line goes northwest down the Weber Valley to Ogden, and two parallel lines go south-southwest to Salt Lake City. Questar operates two underground sandstone-reservoir gas storage units in Chalk Creek Canyon (Chalk Creek and Coalville) that help handle peak load demands during Utah’s cold winter mornings. 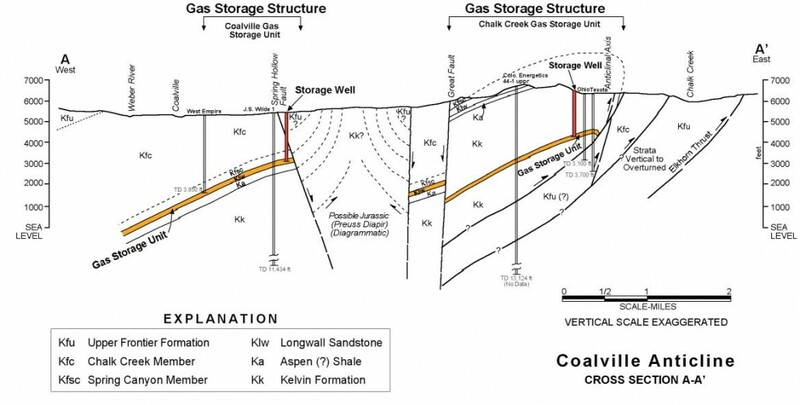 The gas storage units are on the northeast-trending Coalville anticline, which is partly defined by the exposures of the upper Frontier Formation. 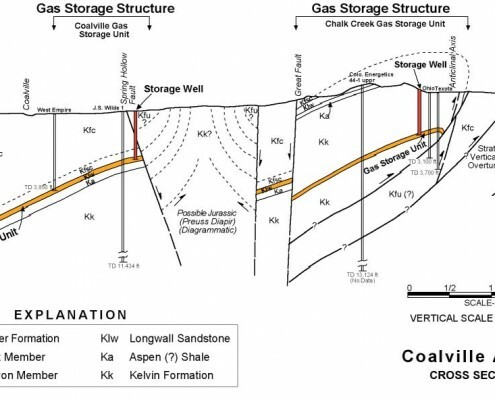 Gas is stored in porous and permeable Cretaceous sandstone beds; the storage unit at Chalk Creek is a sandstone bed in the Kelvin Formation, and at Coalville it is the Longwall Sandstone of the lower Frontier Formation. The trap at both storage units is formed by faults and sealed by overlying impermeable shale. Observation wells at both gas storage units are used to monitor the gas pressure in the storage units and to check for gas in shallower beds to ensure that the gas is not leaking and migrating upward. Drilling at the Chalk Creek gas storage unit began in 1960. The average depth to the Kelvin sandstone is 1800 feet. 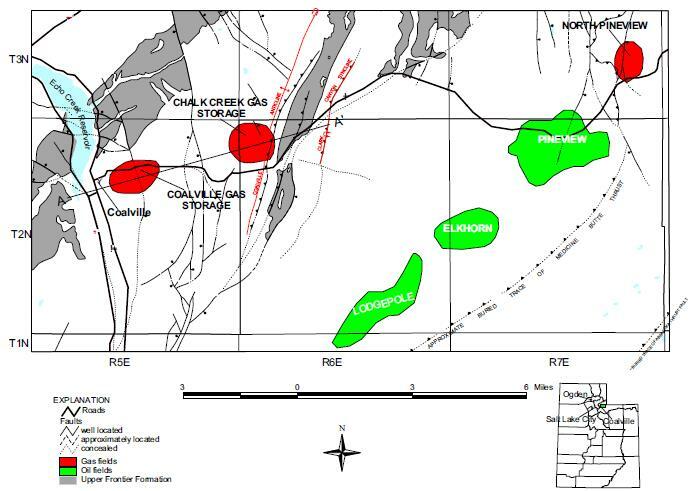 The Chalk Creek unit holds a maximum 1.2 billion cubic feet (BCF) of gas, of which 256 million cubic feet (MMCF) is usable or “working gas.” About 900 MMCF of “base gas” is kept in storage as a buffer between the working gas and the water in the reservoir, and helps push the working gas out by gas expansion. 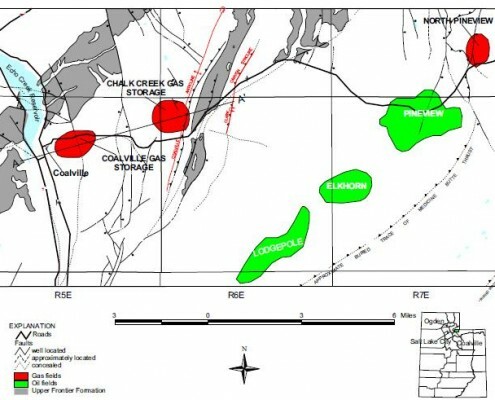 A maximum of 10 MMCF of gas per day can be injected when filling the Chalk Creek unit and a maximum of 35 MMCF of gas per day can be produced. Drilling at the Coalville gas storage unit began in 1973. The average depth to the Longwall Sandstone is 2400 feet. The Coalville unit holds a maximum 2.8 BCF of gas, of which 692 MMCF is working gas and 2.1 BCF is base gas. Gas can be injected into the Coalville unit at a maximum rate of 20 MMCF of gas per day and produced at a maximum rate of 60 MMCF of gas per day. Remember, when you get into the shower on one of those cold winter mornings you aren’t alone; 700,000 others are joining you. So be thankful for a couple of sandstone beds whose stored gas helps meet those peak-load demands. Without them, you might find yourself in a chilly predicament. The map and cross section are based on the work of Lyle Hale published in the 1976 Rocky Mountain Association of Geologists guidebook. Tom Yeager and Chad Jones of Questar Corporation provided helpful information for this article.